On Saturday 4 February, my wife and I attended the Doctor Who Symphonic Spectacular, performed by the amazing Melbourne Symphony Orchestra and the Concordis Chamber Choir. The concert was held at the Melbourne Convention and Exhibition Centre's Plenary Hall, a massive venue that was packed with Doctor Who fans, many of whom (ourselves excluded) had dressed up as their favourite Doctor or donned their nerdiest Doctor Who tees - there were even TARDIS and Dalek themed dresses and many, many fezes and bow ties (they're cool, you see). As expected, the music was incredible. Most of the pieces performed were chosen from the two most recent series of Doctor Who (featuring Matt Smith as the Eleventh Doctor) and were accompanied by clips from their corresponding episodes (sometimes with the original dialogue and effects sounds). The score's composer, Murray Gold, was in attendance and even played the piano towards the end. The orchestra was conducted by Ben Foster, who has been responsible for the orchestrations of Gold's pieces and conducted the orchestra that plays them for TV score. There were also a couple of fantastic surprises that I wasn't expecting (although I probably would have if I'd done some research before going). The first was that the concert was hosted by the incredible Mark Sheppard, an actor that has appeared in all my favourite nerdy TV shows (Doctor Who, The X-Files, Firefly, Chuck, Battlestar Galactica). The second was that throughout the performance professional cosplayers roamed the venue dressed as Doctor Who monsters, including the Silent, the Ood and the Cybermen. 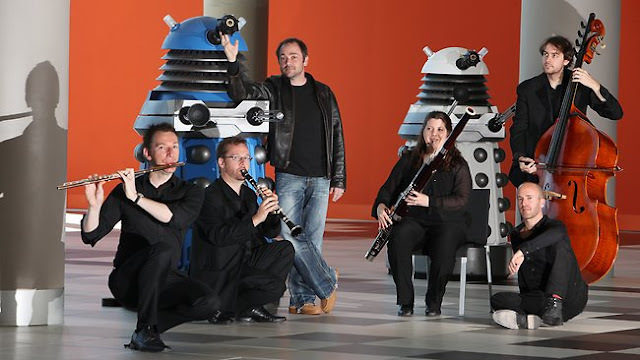 The moment after the interval when the Daleks entered to take over the concert, enslave the orchestra and threaten the extermination of the audience was particularly awesome. Andrew Macleod, David Thomas, host Mark Sheppard, Natasha Thomas, composer Murray Gold and Ben Hanlon get chummy with the Daleks. Picture: Stuart Milligan Herald Sun. Check out the Herald Sun article.